The Greater Portland Chapter of the Maine Genealogical Society will meet Saturday, June 5th, 29 Ocean Rd., Cape Elizabeth at the Church of Latter Day Saints. We gather at 12:30 for a social time, program begins at 1:00 p.m. This month Phyllis Legare will tell us how to “Overcome Brick Walls” (in genealogy research). For more information, call Linda Aaskov at (207) 490-5709. That is the subject at the April 3rd meeting of the Greater Portland Chapter of MGS. Our vital records research uncovers names, dates and places. But that’s only the skeleton of our ancestors. Newspapers can put meat on those bones, and it’s becoming easier than ever to look at our past. This talk will be given by our own Bob Greene. A native of Portland, ME, he joined The Associated Press in Kansas City in 1965. He covered riots in Omaha, NE, and the Rev. Dr. Martin Luther King Jr.’s funeral in Atlanta, GA. He transferred to Milwaukee, WI, in 1968 and to Washington, DC, in 1971. Two years later, he was named correspondent in Portland, ME, before transferring to NY Sports where, in 1980, he was named AP Tennis Writer. He retired in 2001 and the following year moved to South Portland. Besides writing the first book on African Americans in Maine to be published, Greene also contributed to “Maine’s Visible Black History”; teaches an OLLI course on Black History in Maine at the University of Southern Maine; chairs the board of the Jean Byers Sampson Center for Diversity in Maine at USM; is on the board of directors of the Maine Philanthropy Center, the Maine Historical Society and the Maine Freedom Trails; and lectures frequently on the Underground Railroad and Blacks in the military. As a genealogist, he has traced his family back to the 1700s in Maine. He continues to cover and write about tennis as well as genealogy. On Thursday, March 11th, Allen Horne will be discussing Miniature Pictures and Portraits with the Wassebec Genealogical Society. A great opportunity to explore this piece of history – we all enjoy being able to put faces with names on our family tree. Wassebec Genealogical Society meets on the 2nd Thursday of every other month at Mayo Regional Hospital Resource Center at 6:30 p.m. unless otherwise noted. Visit their website at www.rootsweb.ancestry.com/~mewgs to stay current with their happenings. Penobscot County Genealogical Society is pleased to announce their annual Irish-themed March meeting. Dr. Janet TeBrake, Lecturer in History at the University of Maine, will be discussing Irish history and St. Patrick. The meeting takes place on Wednesday, March 17th, at 6:00 p.m. in the Lecture Hall at the Bangor Public Library. Many may recall that Dr. TeBrake was a speaker at the recent Maine Genealogical Society conference that was held in Bangor. Come celebrate St. Patrick’s Day learning about Irish history…. The Greater Portland Chapter of Maine Genealogical Society will meet Saturday, March 6th, at the Church of Jesus Christ of Latter Day Saints, 29 Ocean House Road (Rt #77), Cape Elizabeth, Maine. Social time 12:30, program at 1:00 p.m. followed by a business meeting. Sandy Oliver, food historian will be our guest speaker sharing her knowledge of early New England food – How We Ate American Fare. Pejepscot Genealogy Society will meet on Sunday, February 14, 2010, at 2:00 p.m. in the Morrell Meeting Room of the Curtis Memorial Library, Brunswick. Bring your questions, challenges and lap tops to a problem assistance meeting designed to provide suggestions and direction to aid in your sleuthing. Come early for a social time and to exchange ideas and discoveries. For more information, call (207) 833-7371. The ever-popular Roxanne Moore Saucier, Family Ties columnist for the Bangor Daily News, will be the guest speaker at the February meeting of the Penobscot County Genealogical Society. She will be discussing Sarah Palin’s Ancestry — From Maine to Alaska. The group will meet on February 17, 2010, at 6:00 p.m. in the Lecture Hall of the Bangor Public Library. You don’t have to be a member to of the society to attend. Refreshments will be available. Wassebec Genealogical Society is scheduled to meet at 6:00 p.m. on Thursday, January 14th, at the Mayo Regional Hospital in Dover-Foxcroft, Maine. Jane Fox Whelden will be talking with the group about accessing the resources at the Family History Library in Bangor. For more information about Wassebec, visit www.rootsweb.ancestry.com/~mewgs. Penobscot County Genealogical Society will be meeting on Wednesday, January 20, 2010, at the Bangor Public Library in the Lecture Room. 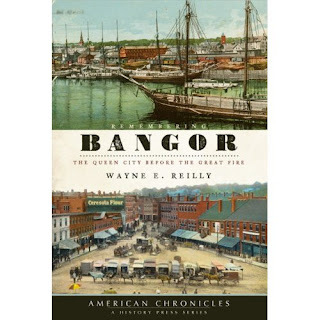 The meeting starts at 6:00 p.m.
Wayne E. Reilly will be talking on “Bangor – A Century Ago.” Wayne is retired from the Bangor Daily News after 28 years as a reported and an editor. His book “Remembering Bangor: The Queen City Before the Great Fire,” contains more than 300 columns he has written for the newspaper about local history a century ago since his retirement. The gathering is open to everyone. You don’t have to be a member of the society to attend. Refreshments will be available. Pejepscot Genealogy Society will meet on Sunday, January 10, 2010, at 2 p.m. in the Morrell Meeting Room, Curtis Memorial Library, Brunswick (enter from Middle Street at the end door). Please join your friends (and probably relatives!) for the program. Arrive early for refreshments and stay late for help with a problem you may be having finding a way through that brick wall. Members will be available until 5 p.m.
For more information, call 833-7371. The Greater Portland Chapter of MGS will be learning about the Settlement of Black Point, Maine “Owascoago” 1605-1800 at its February 6, 2010, meeting. Owascoag or “Place of Much Grass” was the Indian name for Scarborough. The settlement was also called Black Poynt by the English. Owascoag is the story of Black Poynt told in the settler’s own words. Patricia found diaries, letters, depositions, court records, and other interesting material, giving a first hand account of life from 1636 to the 1750’s. The material covers exploration, settlement, and the Indian Wars. So mark your calendars and plan to attend now. Saturday, February 6, 2010, from 12:30 p.m. – 3:00 p.m. at the Church of Jesus Christ of Latter Day Saints, 29 Ocean House Road, Cape Elizabeth, Maine. Winter hours for the Taconnett Genealogical Library in Winslow, Maine, are Saturdays, from 12:o0 – 3:00 p.m. The chapter recently held election of officers and the we congratulate those elected: President Fred Clark, Vice-President Bob Chenard, Secretary Kay Marsh, Treasurer Herb Brock, and Directors Thelma Brooks, Barbara Gunvaldsen and Janet Boynton. They will be holding their Christmas Party on Sunday, December 20th. For more information, visit them at www.rootsweb.ancestry.com/~metfcmgs.